For Physicians & Health Care Providers | Ignite Nutrition Inc.
Current handouts include: GERD, Reducing Risk of Colon Cancer (post-polyp diagnosis), IBS (including access to up-to-date FODMAP information). Download here. Ignite understands one-on-one counselling isn’t for everyone, and that often cost barriers limit access to quality information. Which is why we’ve created low-cost resources to help those who cannot afford one-on-one counselling, but require nutrition help. Resources, accurate food lists, a 5 day low FODMAP menu, and informational videos on properly managing IBS / free! These are the ‘must-have’ resources for getting started on the low FODMAP diet for IBS and functional gut disorders! 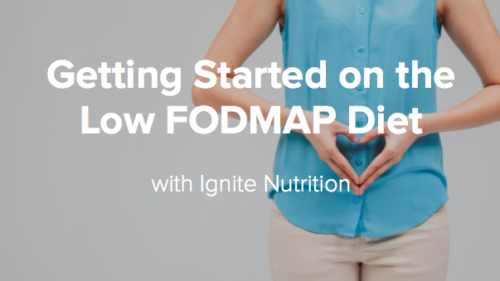 At Ignite, we strongly encourage only implementing the low FODMAP diet under guidance of a trained dietitian or doctor, as often times, we see people make many mistakes that hold them back from getting better. With so much low FODMAP misinformation out there, you can rely on these resources as an accurate, up-to-date way to implement the low FODMAP diet, without confusion or stress. The HARDEST part of the low FODMAP diet is figuring out what to eat, without the overwhelm. Sure, lists are helpful – but implementing the low FODMAP diet can lead to overwhelm. Countless patients have implemented the low FODMAP diet using these menus with great success. It’s recommended alongside nutrition counselling, or alongside the ‘Getting Started on the Low FODMAP Diet’ database. If you or your clinic are interested in an education event, please contact us to arrange a time! Our dietitians are happy to come share with you up-to-date practice information, and practical tips so you can best help your patients. !